As students from more than seventy colleges, universities and environmental organizations came together at Power Up! Divest Fossil Fuels met for the first time to create a comprehensive message and plan of action for the hundreds of divestment campaigns popping up throughout the country, nervous energy and strong resolve were palpable at the welcome plenary session. Just by shaking a few hands you could meet students and organizers from California to Montreal to Washington, DC, all committed leaders in the growing climate justice movement, who have focused their energies on divestment. 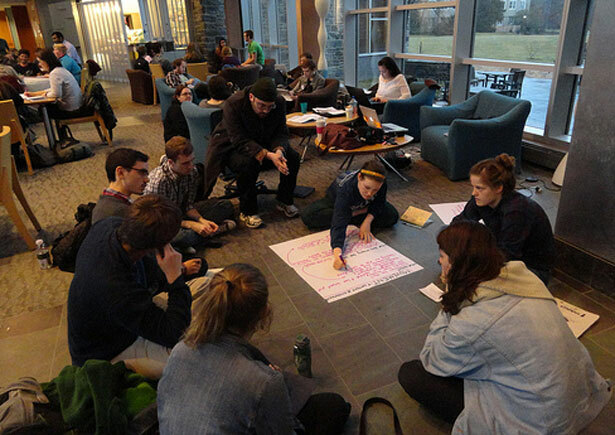 The wide range of experiences, from Swarthmore Mountain Justice’s well-established divestment campaign to a request for “how to start a divestment campaign” shouted out while establishing learning goals, revealed just how valuable this collaboration could be for all involved. During last night’s welcome plenary, Lilian Molina, a mestiza environmental justice advocate with over thirteen years of experience in the climate movement, spoke to the conference attendees about the history of environmental justice activism, pointing to the events in Warren County, North Carolina, in 1982 as the moment where the environmental and civil rights movements first crossed paths. She encouraged the student organizers in attendance to work in solidarity with frontline communities who are directly hurt by fossil fuel extraction, and to be aware of positionality and privilege when doing so. Adam Hall, with the Keepers of the Mountains Foundation, spoke passionately about his meeting with the Swarthmore Board of Managers, expressing his utmost frustration at their simple “no” when asked by a group of more than sixty Swarthmore students to divest its endowment from dirty fossil fuel companies. But he encouraged the organizers to persist, “until we see a better, more beautiful day,” and to not give up the fight. Jackie Gil, a 20-year-old student activist from Brandeis who was arrested last weekend outside the White House (along with the heads of the Sierra Club, 350.org, and other prominent environmental organizations), Skyped in to highlight the power of youth action, and how students have the ability to influence large, mainstream environmental organizations and redirect their vision to be more inclusive and create a more comprehensive climate justice movement. During the rest of the conference, attendees will work towards the realization of these goals. While the task of building a movement may seem daunting, the enthusiasm, expertise and sheer will on display at Swarthmore lend hope to the idea of achieving climate justice in the days, weeks, months and years to come.